I can’t help it, there’s nothing like a guy in a tux. I just had to get James and Gabe into formal clothes at least once. Then of course I had to get those clothes off. The doors slid open. A Town Car was waiting at the curb. They didn’t talk as they made the short trip to Gabe’s building. They just held hands and watched the lights go past outside. They didn’t even talk as the elevator took them swiftly and smoothly up to Gabe’s place. The lights automatically came on as they stepped out of the elevator, neither too fast nor too bright; a soft fade-up to a warm glow. Gabe stepped close and pulled on James’s bow tie until it came loose and slipped from around his neck. He let it drop through his fingers; it fell to the floor without even a whisper. He put the tips of his fingers to James’s cheek next. James leaned into them, noticing the way two were rough and two were smooth. Gabe must have been chewing on them again. He reached up and pulled on Gabe’s tie. It slid from its knot more easily than his had. The silk was cool on the ends and warm where it had gone around Gabe’s neck. He let it drop from his fingers as well. Gabe took a few steps back, and James followed as if being led in a dance. And he followed where Gabe led. It was so easy and felt so right. He usually avoided the easy path. Easy was usually wrong. Gabe changed directions, moving quickly behind James and slipping his coat from his body. James shivered at the sudden change in temperature, from being wrapped in the sultry jacket to having only the fine linen shirt between his body and the air. The chill left as quickly as it had arrived. Gabe stepped in close, pressing himself to James’s back, putting out a powerful heat. He leaned back, still feeling like he was in a dance that had no music with a rhythm that was in constant flux. But still Gabe was leading perfectly. Gabe stripped off his own jacket without ever taking his chest from James’s body. He let the jacket drop to the floor, not even bothering to toss it toward the hooks as he had with James’s. He pressed his lips to James’s neck, right above his collar. James felt his toes curl and his body tingle. Gabe’s fingers were back, skimming along his cheek, and his thumb brushed across James’s lips. He flicked out his tongue to tickle it. Gabe exhaled long and slow, his warm breath slipping under James’s collar. His fingers left James’s face and went instead to his throat, popping open the high collar buttons. James let out a long breath, unaware of just how constricted he had felt until that moment. Gabe slid around him until they were once again face-to-face. He thought they might kiss, but instead Gabe just looked at him, eyes dark in the dim light. He felt his breath hitch and that tightening in his chest return. It was so much like the way Gabe had looked at him their first night. All those months ago now, standing so close that James had been able to smell the hint of peppers on his skin. Now Gabe smelled faintly of fancy cologne that had nearly worn away. He took Gabe’s hand and laced their fingers together as if they would dance. Gabe took his other hand, lifted it, and kissed his palm. James closed his eyes and nearly fell forward. Gabe kissed the heel of his palm next and then placed a kiss on the inside of his wrist. James whimpered softly. Somehow those three small kisses had his head spinning with greater pleasure than kisses in far more intimate areas. Gabe stepped backward, leading them with just the knowledge of the dimensions of his own home. He didn’t lead them to the bedroom, but rather to the large couch of cool leather draped with blankets of the same spun and woven silk as the one on Gabe’s bed. He sat on them and drew James onto his lap, giving James the height advantage for once. James took it, tilting Gabe’s head back and into a slow, lazy kiss, their tongues just flitting around each other’s, chasing the flavor of champagne. Gabe’s arms went around his body, pulling him close. James’s fingers went into Gabe’s hair, tangling themselves in the dark curls, destroying the last of the control imposed by handfuls of hair gel that smelled slightly of mint and clashed with the cologne. Gabe sighed into the kiss and held James tight. He and Gabe kissed. He didn’t think about time; he didn’t think about anything beyond the feel of Gabe’s arms around him and the taste of Gabe on his lips, the sound of their tiny moans and sighs in his ears. At some point Gabe pulled away from the kiss and took a deep breath. He leaned in, laying his head against James’s chest. James became aware of his own heart pounding strong and steady. Gabe looked up at him, a small soft smile on his lips. James kissed those lips, then stood. Gabe followed. This time James took Gabe’s hand and led the dance toward the bedroom. There was no rush. He was content to keep kissing if that was all the night had in store, but he wanted to be lying down in Gabe’s arms while it happened. 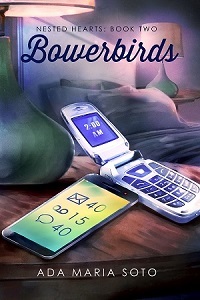 Bowerbirds (Nested Hearts: Book Two) available through Dreamspinner Press.